If you’re looking at the photo above and wondering what it feels like to be in a crowd of that size, with storm clouds looming and thousands of sweaty people pushing you for a better view, I like to compare it being a donut hole, thrown in the microwave, heated until you’re nice and gooey, then sticking to all your donut hole acquaintances, united in the same cause while slightly fearing your ultimate fate. Free Press Summer Festival 2016 was a weekend of 60+ of the best bands in the nation, brewing storms, and a hundred thousand music-loving fanatics. It was the best of times. It was the worst of times. And if I could go back and do every exhausting moment again, I would. But I would want to know three things. So read up, my fellow festival-lovers, because my sunburned pain will be your gain. Obviously, everything was expensive on the NRG grounds — the coolest food truck joints in America were parked around the festival, just begging to be ravaged… at a price. Rather than drop dollar bills on a glass of wine ($9!) or a canned beer (I don’t even know how much that was), channel your inner bad girl/boy, and bring your dranks with you. We managed to get 12 mini bottles of hard liquor through the gates over the course of two days. How? Strategic placement, my friends. Security does check bags and even might check your pockets. But no pat-downs did I see. We stuffed the tiny little bottles wherever we could — the cleavage, the shoes, under our armpits. Make conversation with the lovely gate guards while you go through, and they’re none the wiser. Do I feel bad about this rule-breaking? No. I saved a fortune. And once you’re clear of the danger and riding high on disobedient adrenaline, buy yourself one of the many non-alcoholic, refillable beverage cups and go ham. We brought in peach, lemon, and coconut flavored rums and spiked our own drinks. Saving money, people. It’s a way of life. Sidenote: Recently, I’ve been wanting to wear leather. Must be my inner rebel coming out again. If you’ve never been to a festival, it’s a melting pot of illegal substances and nicotine. And if you’re not about that life like me, you might be utterly appalled by the amount of smoke filling your nostrils from the high school kids lighting up all around you. But how can you get away when you’re stuck between 4 people on each side and The Chainsmokers go on in an hour, so you don’t want to lose your spot? One very clever man gave me this idea — bring a bandana. Whether you wear it on your head, around your neck, or tied to your thigh, this trusty accessory can be used to cover your mouth during everyone else’s highs. You’ll look like an Urban Outfitters ad, and I guarantee a bandana will smell so much better than the dirty t-shirt I was holding to my mouth to keep the stench away. Stay out of trouble, kids. Us adults are trying to rave like we’re still young. Geez. Despite the fact 2016’s festival was more cloud than sun, those rays can still torch your pasty self. With all the skin showing, it’s easy to end up with unfortunately creative burn lines. But even if you forgot to lather yourself before you left the house because your Uber arrived sooner than you expected, don’t fret (that definitely didn’t happen to me). Every medical tent is equipped with tiny packets of sunscreen, and the medics don’t mind giving you more than one. So rub it in, rub it in, and enjoy two days, rain or shine, without burn lines. 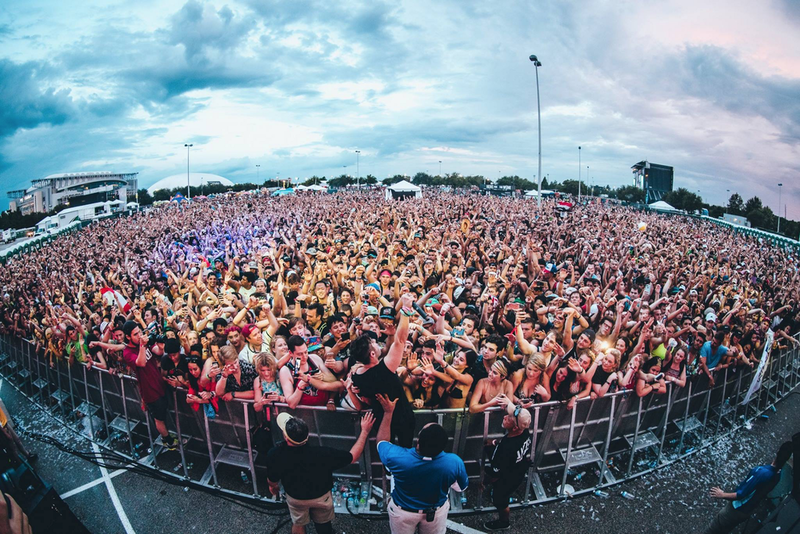 If you’re prepared, FPSF can be the best two days of your life. I had an absolute blast and will most definitely be going again next year. And in case the big dogs are reading this, please bring back Lewis Del Mar and Matt and Kim. I’ll love you forever.